The capital of Ukraine, Kiev (Kyiv) is the most important industrial, cultural, historical and political center of Ukraine. According to the legend, the city was founded in 482 by three brothers, a prince of a Slavic tribe named Kyy, his two younger brothers and their sister, Lybid. And during the last 15 centuries, Kiev has become one of the most beautiful and populous (3 million residents) cities in Europe. It's impossible to visit Kiev and not fall in love with this green city, located on the banks of the Dnipro River! And everybody finds something special in its charm. 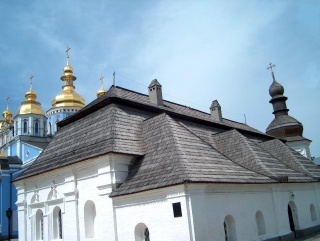 Some people spend hours looking at the gold domes of the many cathedrals and churches on Kiev's hills. Other tourists explore the historic architecture of the town that very often has monuments from the Stone Age (40-10 B.C.) to our days just several meters from one to another. 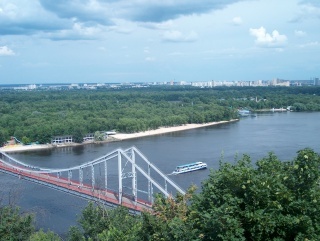 But many visitors just like to walk along Kiev spacious streets and boulevards, which are lined with chestnut and poplar, and look at the open and smiling faces of this magic city's people. And what could be more interesting than learning the history and culture of Ukraine by visiting museums, art galleries and theaters? Ukrainians have made a spirited effort to preserve their cultural traditions and customs. There are so many art galleries and exhibitions, historical museums and outdoor museums, and villages displaying buildings, crafts, and living conditions of the last century. And don't forget to visit the Kiev Opera House, home to a very good opera company and to a ballet company of considerable talent and an expansive repertoire. Kiev always has something special to offer for its guest: Museums, unforgettable monuments and excursions for tourists. The best educational programs at one of the oldest and most prestigious Ukrainian institutes of higher learning, Kiev State University and Polytechnic University, for foreign students; and Profitable business contacts with Ukrainian businessmen and scientists for visitors who come to Kiev with a business purpose. Visit Kiev and other cities of Ukraine, Russia and Moldova with UkraineTour!